NEW YORK (AP) — Floyd Mayweather Jr. tossed $1 bills in Conor McGregor's face. McGregor waved Jay Z's new CD in Mayweather's direction and quoted a Biggie Smalls lyric as some sort of warning shot. The fashionably late fighters treated fans who'd waited hours for the latest stop in a promotional tour to about 30 minutes of profanities, crude cracks about body parts, and, well, a steady stream of even more f-bombs. If Mayweather and McGregor turned their latest showdown into a true PPV — pay-per-vulgarity — they'd collect a few million bucks before they even hit the ring for their Aug. 26 fight. All this commotion — a DJ and rapper Doug E. Fresh warmed up the crowd of 13,165 — for a press conference. "If it even is a press conference," McGregor cracked. "It's a bit of a roasting." McGregor, who turns 29 on Friday, was the picture of cool as he walked the red carpet inside Barclays Center. The UFC star wore floral pants, sunglasses and ditched a shirt for a white fur coat he bought earlier in the day in a Fifth Avenue shopping spree. He could afford the outlandish outfit. McGregor and Mayweather will earn perhaps nine-figure paydays while fight fans will be charged $100 to watch on TV in high def and can't get into the arena for anything less than a $500 face-value ticket —if they're lucky. But in New York, where a "Hamilton" seat can cost you a rent check, there's still a deal to be found — even in the fight game. The fight angling to become the richest in sports history is offering fans a bargain-basement price for this weeklong smack-talking circus: Free. It's the cleanest four-letter word uttered by the Irish sensation McGregor and the undefeated boxer Mayweather during a foul-mouthed promotional tour that stopped Thursday in New York. They had made stops in Los Angeles and Toronto. "When I wake up in the morning, I forget that I'm famous," the 40-year-old Mayweather said. He got a reminder in Brooklyn. Fans lined outside the home of the Brooklyn Nets NBA team hours before they were allowed inside the arena. 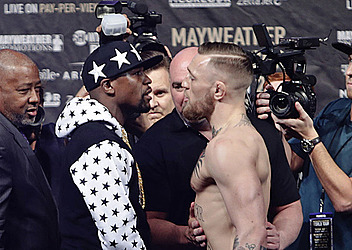 They flocked in TMT gear or draped themselves in Irish flags as they waited for the pair to start trading insults weeks before they exchange blows. Jon McFaul, 28 of South Jersey, ordered his ticket online not long after they were made available to the public. McFaul and his friends showed up at noon for their shot at being among the first through the doors. McFaul, a McGregor fan, said he'll watch the fight with friends to split the $99.95 bill for the high-definition pay-per-view. "You're bringing the best of two worlds together," he said. "But I think the press conference is going to be better than the fight itself." Tickets were free and a limited number were still available at the box office about 5 hours before showtime. But security turned fans away 30 minutes later and told them there were no more available. They could have turned to the web: eBay had press conference tickets available for $50 for the Brooklyn tour stop and were going for about $80 for the final one in London. "That's just dirty, selling press conference tickets," UFC President Dana White said. "You can't sell tickets to a press conference." The tour ends Friday with its fourth stop in London — who knows, that may be more rounds than the actual fight, which many experts believe will be lopsided for the undefeated Mayweather. "Mike Tyson back in the day knocked out people in the first round," McFaul said. "I want to see the spectacle." Yes, the hype could go down as a more entertaining time than the 154-pound fight Aug. 26 in Las Vegas. The fighters can entertain as much as anything on Broadway. McGregor wore a white Gucci mink coat and raised a steel chair high over his head during a press conference at Madison Square Garden in November to promote his last UFC fight. And Mayweather has been living up to his "Pretty Boy" and "Money" nicknames as both fighters try to hype the fight. McGregor encouraged the crowd to shout expletives at Mayweather and his family before launching into a nearly 10-minute profanity-laced tirade during a stop Wednesday in Toronto. Mayweather mocked McGregor for being less wealthy and answering to White. And some fans accused McGregor of being racially insensitive when he yelled, "Dance for me, boy! Dance for me, son!" during an exchange. Mutual respect between the fighters has suffered a resounding KO.